Scottish landscapes and seascapes are Monaghan's main inspiration. But she also loves painting subjects from past memories. Ian McWhinnie solo exhibition opens 11 September. The exhibition features 15 brand new paintings from Ian and runs for two weeks. Inspiration for her paintings is taken from still life to seascape and townscape subjects. 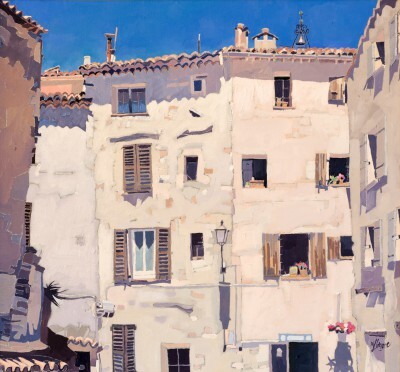 Always evident in Irvine's work is the focus on light, shade and pattern. Right now at Red Rag Gallery in the Cotswolds is the annual 'Scottish Show'. More than 30 Scottish artists are participating in the exhibition. Starting this weekend at Red Rag in Stow is a three person show. Featuring in the promotion are three leading artists known for paintings of Figures. The latest exhibition at Red Rag Gallery in Stow is a mixed show featuring Still Life works. are showing equestrian inspired art works from Scottish artist Catriona Campbell. Red Rag are offering a superb still life by Elizabeth Blackadder. New art works from artist Robert Kelsey are now in the gallery. His work captures light and colour with unparalleled accuracy. Opening this coming weekend is the latest exhibition at Red Rag Gallery in Stow. It is a mixed art show featuring artists who are inspired by the British landscape. 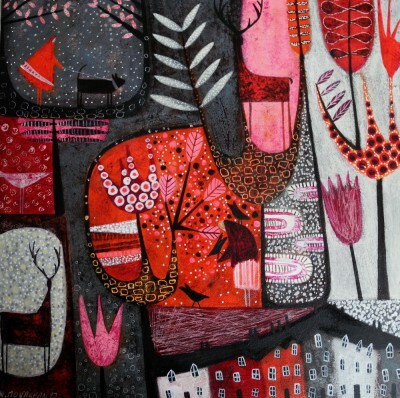 Work from Scottish artist Deborah Phillips is in the show. Stephen Brown, Steve Capper, Amanda Hoskin and Mark Preston. New art works from Scottish artist Ian McWhinnie are now in the Red Rag Stow gallery. 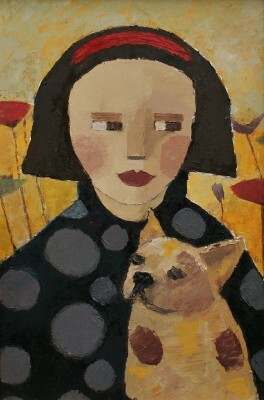 McWhinnie has a very personal and recognisable painting style. His subject matter is diverse - inspired by childhood memories, Italy, musicians, dancers and the circus. McWhinnie paintings depict Figures of strong character. Leading Glasgow artist George Devlin died yesterday aged 76. He was an internationally known artist with a international reputation for his landscape and still life paintings. George was born in Springburn and trained at Glasgow School of Art. He exhibited widely throughout his career at numerous galleries including Red Rag Gallery. He is survived by his wife Marie and daughter Nuala. One of Scotland's most cherised buildings has been severely damaged by fire. The Glasgow School of Art Charles Rennie Mackintosh building was set ablaze yesterday after a projector exploded in the basement. All staff and art students were said to have escaped safely. The world famous Charles Rennie Mackintosh building has been a working art school since 1909. Scottish artists Mary Davidson, Gary Morrow, Mairi Stewart and Helen Turner are among a number of artists participating in the latest Red Rag show in Bath. Changing Seasons is the title of the latest modern art show at Bath gallery. It is a mixed exhibition which captures the essence of each changing season. Altogether there are eleven artists participating in the show which starts Sunday 13 April and continues until 27 April. The next show at Red Rag Gallery in Stow is the annual 'Scottish Exhibition' - a mixed show featuring many of today's leading Scottish artists. One of the participating artists is Pam Carter who is known for her wonderful atmospheric oil paintings detailing the Scottish landscape. The show starts 14 July and the gallery is open each day from 10:00. Red Rag is open at 10am today and will be showing 'Marjorie' a lovely oil painting from Scottish artist Catriona Millar. The painting is part of the current exhibition featuring people and places. The latest show at Red Rag Gallery in Stow is 'People and Places' - a mixed show with the emphasis on figures. Artists participating include Alan Kingsbury, Janet Ledger, Sophie McKay-Knight and Ian McWhinnie. The gallery is open each day from 10:00 and the exhibition continues until 8 June. Red Rag is offering art works from leading Scotish artist Archie Forrest. Works by Forrest are becoming increasing collectible. He is an elected member of the Royal Glasgow Institute of Fine Arts. His paintings are in the tradition of the Scottish Colourists and are highly sought after. His paintings appear in many private and public art collections, including National Portrait Gallery and the Scottish Opera. British artist Storm Thorgerson who designed some of the most famous music album covers of all time has died aged 69. His artworks were used for album covers of Pink Floyd, Led Zeppelin, Muse, Genesis, Phish and many other major rock bands. Thorgerson had a long association with Pink Floyd, designing the vast majority of their album covers, including Dark Side of the Moon, Wish You Were Here and Animals. Pink Floyd guitarist and vocalist Dave Gilmour said the artworks Thorgerson created for the band had been "an inseparable part of our work". He died surrounded by family and friends after a long battle with cancer.